For the past decade, Wellington International Ukulele Orchestra has been getting concertgoers off their feet and dancing the night away to their eclectic mix of ukulele-driven tunes. The New Zealand-based group's repertoire is comprised of classic ukulele standards and pop hits reworked into upbeat singalongs. They've covered everything from Outkast's "Hey Ya" and Pharrell's "Happy" to Toto's "Africa" and Cream's "Sunshine Of Your Love". Each song boasts beautifully layered vocal harmonies and toe-tapping melodies, capped off by the group's comical banter and contagious enthusiasm. Their amazing chemistry, stunning string work, and eccentric stage outfits add up to joyous experiences that leave ticket buyers smiling ear to ear. 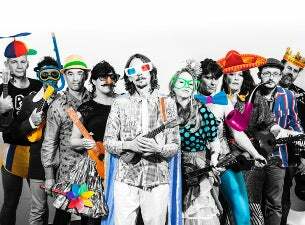 Wellington International Ukulele Orchestra is an ensemble of ukulele players based in Wellington, New Zealand. Founded by longtime friends Age Pryor and Bret McKenzie, the group played its first gig as a six-piece in 2005. Within a year they had doubled their lineup to an even dozen, comprised of 11 ukulele players and one double bass player. The group's public profile got a boost thanks to McKenzie's popularity as one half of comedy rock duo Flight of the Conchords, which resulted in his occasional absence from their live shows. In 2007 the orchestra released their debut EP The Heartache, followed by 2008's A Little Bit Wonderful, which topped the New Zealand Indie Music Chart. Over the next few years they released two more EPs -- 2009's The Dreaming and 2011's I Love You... -- and built an enthusiastic fanbase with performances at festivals like Edinburgh Festival Fringe, WOMAD New Zealand, and Cuba Street Carnival. In 2014 the group dropped its highly anticipated adebut album Be Mine Tonight, and finished off the year with critically acclaimed performances in China, Japan, and their native New Zealand.